The Music House Museum presents a triple feature of heroic women on Nov. 24th at 5:30 & 7:30 pm. Organist Dave Calendine has chosen three film shorts where the female leads save the day during these adventures. This a bit surprising given that the films were made between 1912 and 1915, however this was at the height of the suffragette movement. They were all incredibly popular. Two of the films, starring Helen Gibson, were part of the "Hazards of Helen" series. This incredibly popular series ran from late 1914 to early 1917. it is one of the longest non-feature-length motion picture series ever filmed, and is believed to be the longest of the film serial format. The third short features actress Anne Q. Nilsson, "Anne Q", who became an immediate sensation after her first film role in 1911. In 1914 she was chosen the most beautiful actress "in the world" and Photoplay magazine named her "the ideal American girl" in 1919. This third film does not focus on her beauty but on strength and intelligence. The "Hazards of Helen" films are "The Wrong Order Train" and "The Leap for the Water Tower". In the first Helen finds herself on the rear observation deck of a runaway express train with the door to the inside closed, with the air-brake of the engine damaged, the engine itself full of steam and inaccessible, and the train speeding ahead on the wrong track. 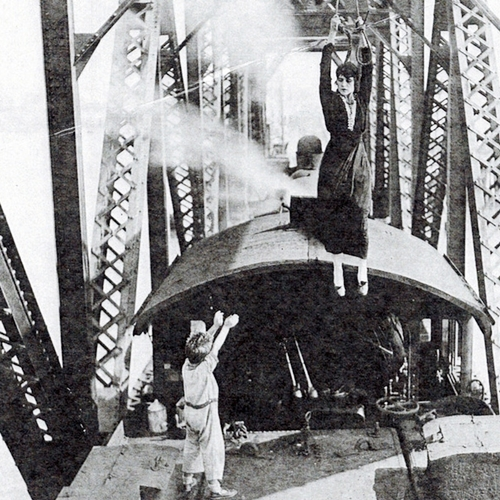 In the second film "Leap From the Tower", a disgruntled fired worker decides to get even by tampering with the brakes of a large train. Helen receives the news at an intermediate station and has to try and fix the problem before disaster strikes. In keeping with the 'train' theme, the third film features Anne Q. as the telegraph operator at the local train station in "The Grit of the Girl Telegrapher". She discovers that a notorious car thief is in town and decides to bring him to justice. Dave Calendine is a Music House Museum favorite! Now a resident of the Detroit area, Calendine has served as an organist for The Detroit Red Wings, is a staff organist at The Fox Theater, performs at The Redford Theater and at his church as well as concerts at the Sanfillipo Foundation in Illinois, and at the national Music Box Society International conventions. He also serves as the national president of the American Theatre Organist Society (ATOS).